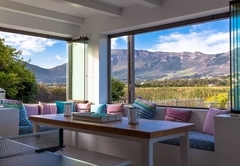 Noordhoek House is a highly recommended property providing self catering in Noordhoek for up to 8 guests visiting the Atlantic Seaboard region. 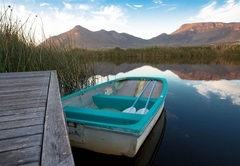 Noordhoek House sits on the water’s edge of Lake Michelle, one of South Africa’s premier Eco Estates. It is situated on the west coast of the Cape Peninsula and provides breathtaking views of Chapman’s Peak and the surrounding hills. 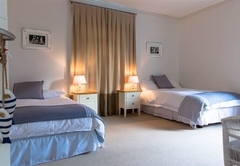 Noordhoek House is a privately owned 4-bedroom holiday home. 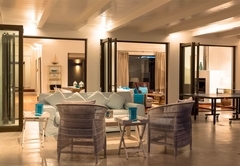 The property is equipped with everything necessary for the perfect holiday. This spectacular split-storey house, situated on the banks of the Lake, offers a homely base for you to enjoy your holiday from. 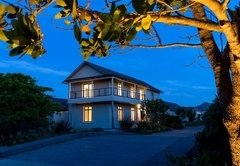 The views of Chapman’s Peak, enclosed swimming pool and direct lake access, all means this is more than just a home away from home. 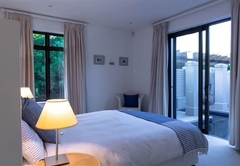 The actual house is split, with a double-storey section that houses the four double bedrooms (three of which have en-suite bathrooms) and a guest toilet. 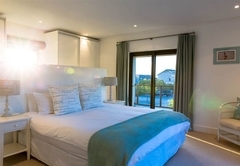 The upstairs master bedroom has a balcony and provides stunning views of the surrounding hills. Between the sleeping quarters and the lake facing lounge and terrace area, is the solar heated courtyard pool with a wooden decking. 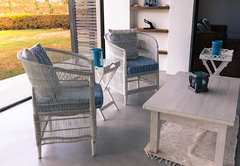 The design is optimized for maximum sun, and makes a wonderful location to laze away those windier days on the provided sun loungers. The open plan dining, living and kitchen area, provides a light and airy space where you may be surprised to find yourself spending much or your time. 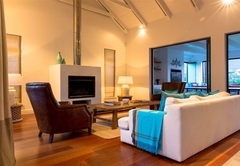 Depending on the time of year and weather conditions, either open the whole house to the elements and enjoy the scenery or on wintery nights close everything up, light the fire and use the indoor barbeque. The kitchen and separate scullery comes fully equipped with washing machine, tumble dryer, fridge/freezer inc. ice machine and dishwasher. It also comes with a Nespresso coffee machine, so don’t forget to bring your own capsules. 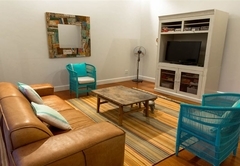 A separate TV / playroom, also opens up to the garden and includes both satellite and Apple TV, a DVD and iPhone/iPod docking station for your music. The double garage leads straight into the house. Lake Michelle is a secure Eco-Estate, where life itself is based around the 22 hectare saline lake itself. Designed in a way where the houses blend with the surrounds, you’ll feel you are in a wilderness nature sanctuary. The lake itself has many species of fish and if you are observant you can see all of the 120 species of indigenous and migratory birds, including Fish Eagles and Kingfishers that either house permanently of occasionally visit at Lake Michelle. You are able to access the lake, simply by walking to the end of the premises garden or by walking on the neighbouring wooden jetty. Here you can decide whether you wish venture to the middle of the lake in the provided inflatable dinghy or relax next to the waterfront in the garden chairs. Have a sundowner to round of the holiday experience and sit back and enjoy the stunning scenery. For the more active, you can canoe and sail on the lake or cycle, rollerblade, skate and run around the estates perimeter. 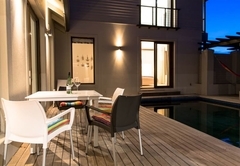 If you are looking for a home away from home that is fabulous, safe and secure, then this is house is for you. We stayed here for 6 nights with both 4 kids (under 5) and my parents entow. There is oodles of space here so everyone can do their own thing, The kids had a back garden to play in and the private pool is wonderful, but very safe. You can lock the doors to keep small ones away from the pool. With regard to mod cons the house has everything you would need- everything. The owners of the house and the house manager were all also wonderful. Friendly, helpful & informative All in all a great house in a great location and friendly neighbours to boot!